ON THIS DATE (May 22, 2008) ... The Sox today hit two grand slams off the obliging Royals, which actually happens with less frequency than a no-no. J.D. Drew connected with the bases loaded in the second off starter Brian Bannister. 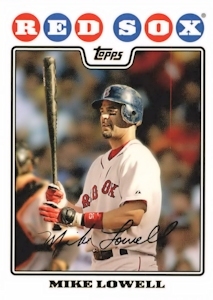 Mike Lowell, following an intentional walk to Manny Ramirez, delivered in the sixth off lefthander Jimmy Gobble, runs that proved the difference in an 11-8 win that kept Daisuke Matsuzaka undefeated (8-0) before 37,613 at Fenway Park. It was the first time the Sox have had two slams in a game since switch-hitting Bill Mueller hit two in Texas in 2003. Mo Vaughn and John Valentin did it in New York in 1995, and Tony Armas and Bill Buckner were the last Sox tandem to do it in Fenway, in 1984. According to David Vincent, the home run historian, there have been only 72 occasions in which a team has hit two grand slams in one game, and his records go back to 1876. In that span, there have been 245 no-hitters. Lowell was surprised, by the way, to hear that his slam was the seventh of his career. Forgive Sox fans, meanwhile, for starting to believe that slams are as much second nature to Drew as they are to Ramirez, the grand pooh-bah of slams (20, but none since 2005). Drew's first one with the Sox was a signature moment in team history, coming in the first inning of Game 6 of last year's American League Championship Series against the Cleveland Indians, a single swing buying him absolution for a desultory regular season.